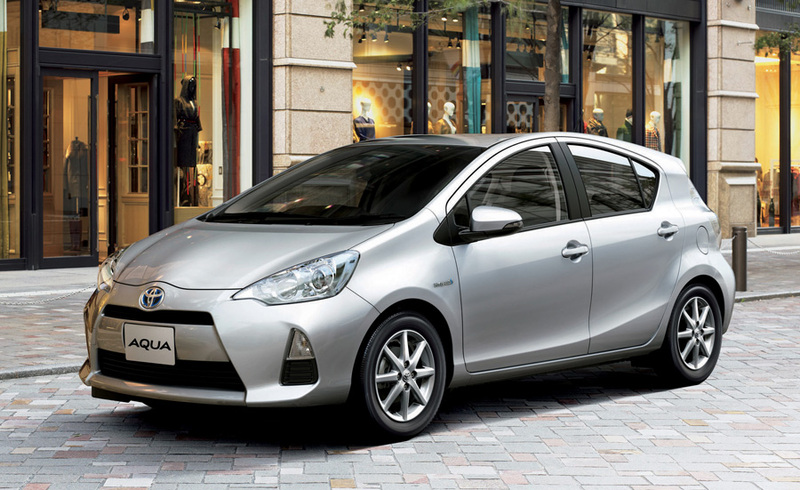 Toyota announced the launch of the "Aqua" gasoline-electric compact hybrid in Japan today. The Aqua incorporates 17 years of Toyota expertise and technology in the development of mass-produced hybrid vehicles, and boasts a small, light and efficient hybrid system that achieves a world-leading*2 fuel efficiency of 35.4 km/L under the Japanese Ministry of Land, Infrastructure, Transport and Tourism's (MLIT's) JC08 test cycle and 40.0 km/L*3 under the MLIT 10-15 test cycle. With a starting price of 1.69 million yen, (USD $21,700) the Aqua offers the pleasure of hybrid vehicles to an even broader range of consumers in Japan. The Aqua features a state-of-the-art, small, light and efficient 1.5-liter Toyota Hybrid System II (THS II) with reduction gear, which achieves a fuel efficiency of 35.4 km/L in the JC08 test cycle and 40.0 km/L in the MLIT 10-15 test cycle. A cooled Exhaust-Gas Recirculation (EGR) system improves efficiency in the high-expansion-ratio Atkinson cycle engine. Also contributing to increased engine efficiency is a battery-powered water pump, a friction-reducing beltless design and precise coolant-water-flow volume control. The hybrid transaxle, which includes the power control unit, the power-generation motor and drive motor, has also been designed to be small and light. A selectable electric-vehicle mode (EV Mode) enables driving with only the electric motor. The Aqua's active and fun styling provides outstanding aerodynamic performance with a comfortable interior in a compact body. The exterior offers a bold and modern design with a powerful and refined front mask and a rear silhouette that evokes imagery of brisk yet stable driving performance. The vehicle comes in ten vibrant and stylish body colors, including new Citrus Orange Mica Metallic and Lime White Pearl Crystal Shine. The instrument panel structure evokes a great sense of space, while the modern and geometric layout with color-coded, switch-operated areas reflect the pursuit of enjoyment and user-friendliness. Distinctive and effective accent color placement contributes to a brighter interior and is available in four patterns: Earth Brown, Fresh Green, Cool Blue, and Natural Gray. Front and rear seats with ample head clearance and legroom provide excellent comfort. The hybrid battery has been sized for placement under the rear seat, resulting in a spacious cargo area of 305 liters*4. In addition to a long 2,550 mm wheelbase, the hybrid unit and engine are positioned to create a low center of gravity for superior maneuvering performance. Engine and motor power combine to provide smooth acceleration from standstill to 100 km/h in 10.7 seconds and also at mid-range speeds, such as from 40 km/h to 70 km/h in 3.6 seconds (all measurements according to TMC). With a minimum turning radius of 4.8 meters, the Aqua also boasts excellent manoeuvrability. The instrument panel sports a myriad of functions that support environment-conscious and enjoyable driving. The Hybrid System Indicator offers easy-to-understand information concerning eco-driving, such as effective accelerator use. In addition to the standard display, an optional high-resolution thin-film-transistor liquid crystal multi-information display provides a variety of eco-driving information. Eco Judge ranks eco-driving on a 100-point scale, and Eco Wallet shows money saved as compared with other levels of fuel efficiency. ABS with Electronic Brake-force Distribution (EBD) maximizes braking performance, with the EBD appropriately distributing braking force between the front and rear wheels according to driving conditions. Also, a brake assist function generates extra braking force to assist the driver in emergency braking situations. Vehicle Stability Control controls brake and engine output to maintain vehicle stability if skidding occurs. Traction Control controls wheel spin to simplify acceleration operation. Hill-start Assist Control reduces anxiety about the vehicle rolling backwards when starting on a steep incline. Automatic air conditioning comes standard on all models and is equipped with an electric inverter compressor run by the electric motor, enabling a comfortably air-conditioned interior even when the engine is off. In addition to seat heaters, the exhaust heat recirculation system draws heat from the engine directly into the cooling water, enhancing heating performance and fuel efficiency in the winter. The Aqua is available in seven different packages.